After i figured out how to show length contraction in this topic. I tried to use a similar way to show time dilation in Minkowski diagram. Time dilation means that time interval between two events is the shortest in the frame in which those two events happen in same place. We call this frame its rest frame. According to just said I set up my problem so that frame $x,ct$ is my rest frame as edges of a time interval $\Delta t$ happen on a same vertical line. This means that time interval $\Delta t$ should be the shortest time interval compared to time intervals in any other frames. Including frame $x',ct'$. But when i draw time interval $\Delta t'$ it is obvious that it is shorter than interval $\Delta t$. So why do i get time contraction instead time dilation? Marks $1'$ and $2'$ on $ct'$ axis are further appart than marks $1$ and $2$ on $ct$ axis (i even draw a parabola to show this). This is why $\Delta t = 1$ and $\Delta t' < 1'$. We want to find the (coordinate) elapsed time between two events. Let those two events be the origin and $ct=1, x=0$. Clearly, these two events are co-located in the unprimed coordinate system and so, the unprimed coordinate elapsed time is equal to the proper elapsed time between these two events. 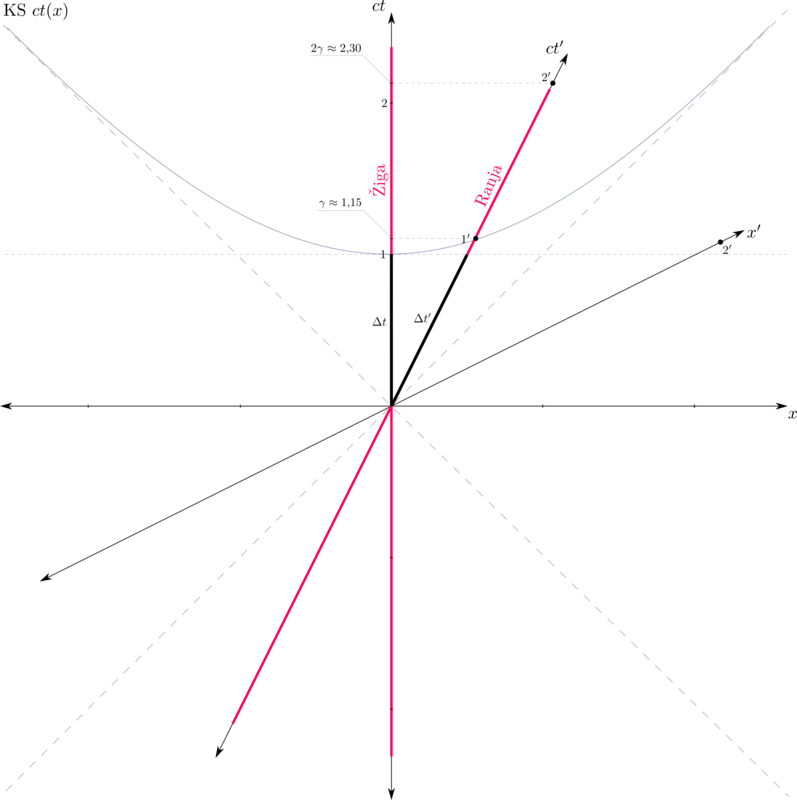 To find the coordinate elapsed time in the primed coordinate system, draw a line, parallel with the $x'$ axis, through the 2nd event. This is a line of simultaneity in the primed coordinate system. In other words, all the events along that line occur at the same time according to the clocks moving with the primed system. 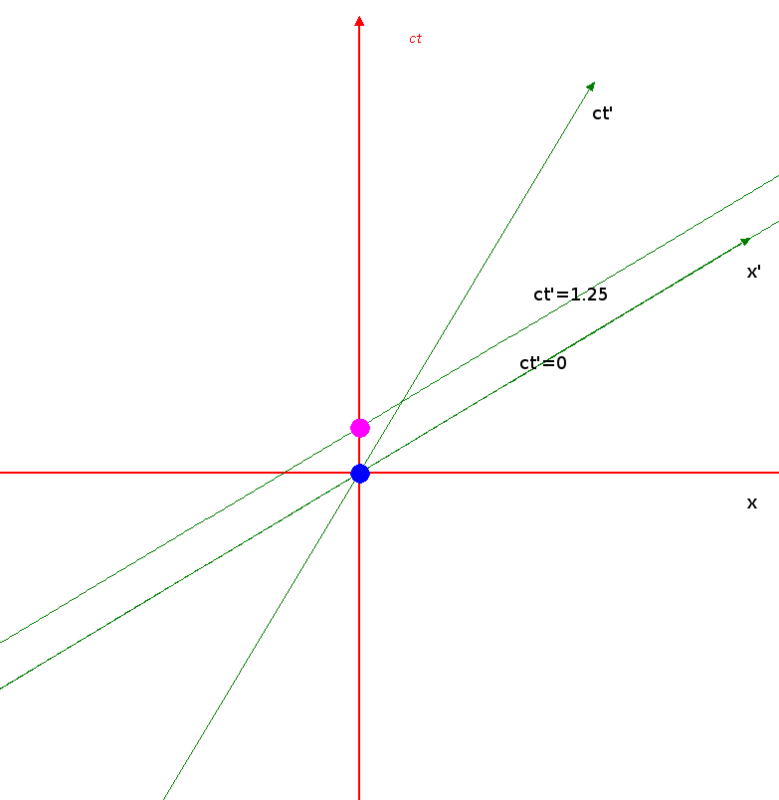 So, the intersection of this line with the $ct'$ axis gives the primed coordinate time of the 2nd event. You shall see that the primed elapsed time is larger. In the image above, $\gamma = 1.25$. For the $x'$ axis, $ct'=0$. For the line parallel to the $x'$ axis through the 2nd event, $ct'=\gamma=1.25$. Is it correct that there is time dilation and time contraction in the same reference frame? What am I doing wrong while proving time dilation using Minkowski space-time diagram? Why is proper time undefined for space-like and light-like intervals? How did we get the time dilation equation from this proper time equation? Why does time dilation require events to occur at same point in space?